Featuring a public glass slide talk and demo with visiting artist, Pablo Soto. Pablo Soto lives and works in Penland, N.C., where he maintains a glass studio. He first fell in love with glass at age 5 watching Lino Tagliapietra work. He earned his BFA in glass from Alfred University (New York) in 2001. 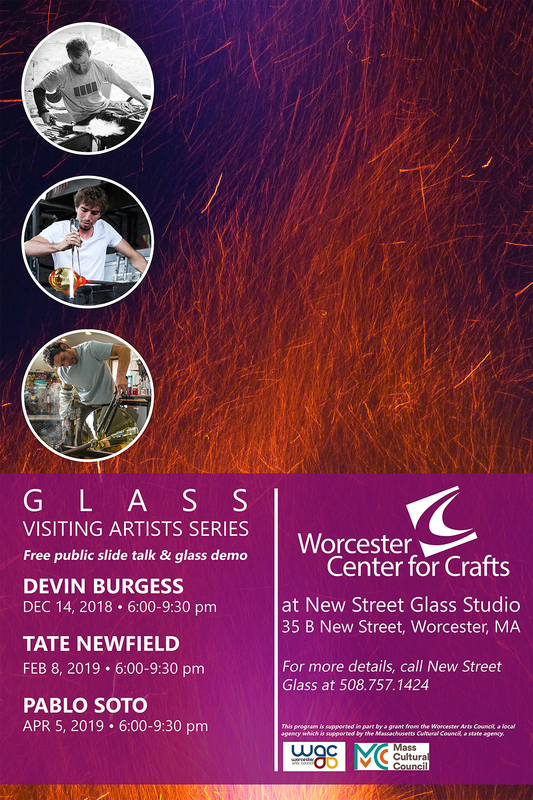 Later, he apprenticed in Ben Moore's studio in Seattle, Wash., and was a glass resident at the Energy Exchange in Burnsville, N.C., a three-year program designed to offer renewable energy sources to support glass and ceramic artists. In 2007, Soto was awarded "Excellence in Glass" at the Philadelphia Museum Craft Show, ACC Baltimore, and the Smithsonian Craft Show. In 2008, Soto received a NC Arts Council Fellowship Grant. His teaching experience includes courses at Penland School of Crafts, Haystack, Pilchuck Glass School, Pittsburgh Glass Center, and Ox Bow. His work is represented far and near.